Dale Peterson arrived in Cannon Falls, MN in 1939 ready to do what he loved – grow turkeys. He found his farm in the Little Cannon River Valley with his wife Fern. Now their grandson, John, and his wife, Erica, carry the farm into the third generation. They grow turkeys free-range during the warmer months and move the birds to fresh pasture weekly all summer so they have access to clean air and fresh grass. 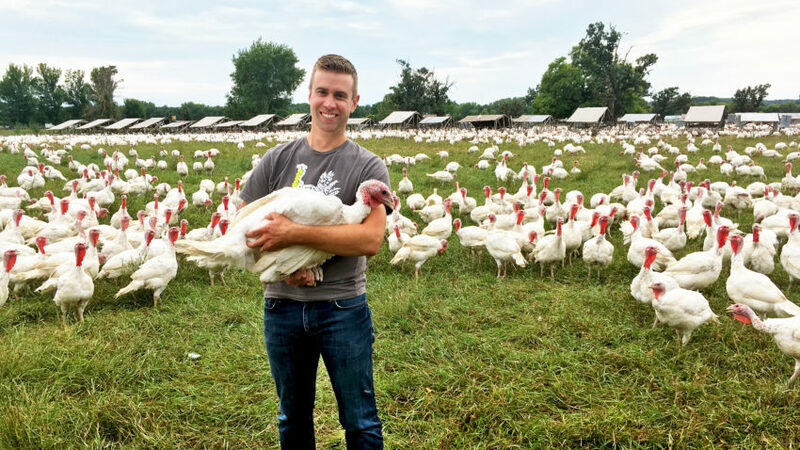 Ferndale turkeys grow naturally, without the use of antibiotics or artificial growth promotants, and they enjoy constant access to a diet of grains, vitamins, and minerals from a local feed mill. All Ferndale turkeys are processed-naturally, without additives. Ferndale ground turkey is available year-round in our co-op, and we carry whole turkeys for Thanksgiving. You can’t beat the flavor!